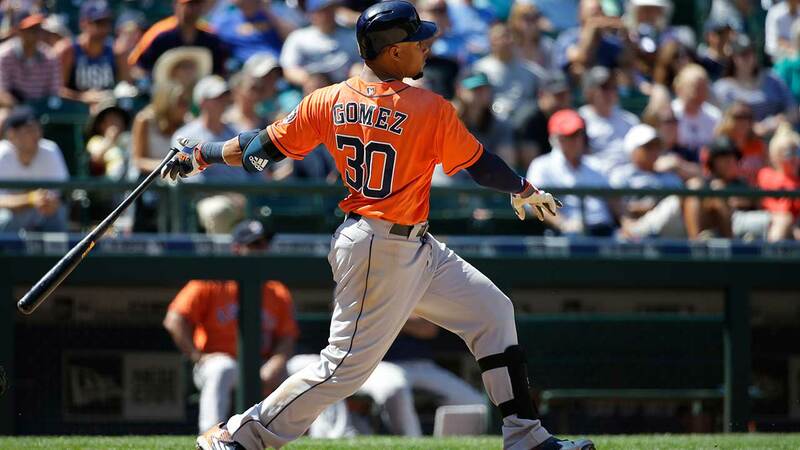 Carlos Gomez smacked a grand slam Sunday in the Astros 8-1 win over Seattle Sunday. SEATTLE, WA -- Jose Altuve homered among his four hits and drove in three runs, Collin McHugh escaped a pair of bases-loaded jams to pitch six scoreless innings, and the Houston Astros beat the Seattle Mariners 8-1 on Sunday. Altuve had a two-run homer and three singles in five at-bats to raise his American League-leading average to .346. McHugh (6-6) allowed four hits and walked four, striking out 10 to win for the first time in eight starts since his last victory on May 30. Carlos Gomez added his second career grand slam in the seventh inning off Nathan Karns to put the Astros up 8-0. Kyle Seager singled home Seattle's only run in the eighth off Chris Devenski. Mike Montgomery (3-4), making his second start this season after 30 relief appearances, allowed four runs and seven hits in five innings, walking two and striking out seven. Altuve got the green light on a 3-0 pitch in the third and delivered his 15th homer to follow Marwin Gonzalez's leadoff double, putting Houston up 3-0. The Astros made it 4-0 in the fifth when Gonzalez again doubled to open the inning, took third on a throwing error by center fielder Leonys Martin, and scored on Altuve's single to left. The Astros hustled across an unearned run in the first. Gonzalez reached on a fielder's choice and Altuve singled. Gonzalez stole third and continued around on an error by third baseman Seager, who misplayed the throw from catcher Jesus Sucre. McHugh escaped a pair of bases-loaded situations without allowing a run. In the first, Seager's one-out drive to right with the bases loaded barely hooked foul. Seager then struck out and Dae-Ho Lee bounced back to the mound. In the third, the Mariners loaded the bases with no outs on a walk to Leonys Martin, a pop single by Robinson Cano on an overturned call and Nelson Cruz's single to the base of the wall in right-center. McHugh struck out Seager and then enticed Lee into an inning-ending double-play bouncer to second. With nobody out in the third, Astros shortstop Carlos Correa dropped Cano's pop up while reaching across the foul line behind third base while looking back into the sun. The Mariners challenged and the call was overturned after a review estimated at 2:08, giving Cano a single to put runners at first and second. Astros: SS Correa was hit by a pitch in the seventh. He stayed in the game, but was replaced by a pinch-hitter in the eighth. Mariners: SS Ketel Marte and OF Nelson Cruz both returned to the lineup after missing Saturday's game. Marte injured his ankle Friday night and Cruz fouled a ball off the top of his left foot. "They both came in today and both felt good enough to play and run around, especially Nellie in the outfield," manager Scott Servais said. Astros: RHP Mike Fiers (6-3, 4.35 ERA) opens the three-game series at Oakland. Fiers allowed four earned in runs in 3 1/3 innings with a no-decision in his last start prior to the All-Star break, but he has not lost in seven starts since May 27. Mariners: LHP Wade LeBlanc (1-0, 3.52 ERA) makes his fourth start since being acquired in a trade with Toronto to open the three-game series against the White Sox at Safeco Field. He pitched six innings in each of his first two starts, but allowed five runs and six hits in 3 1/3 innings in his last start, a no-decision against the Astros.